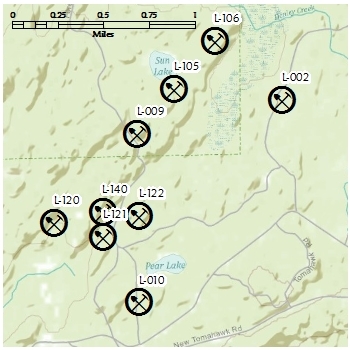 November 2, 2015 - OPEN-FILE: Whole Rock Analysis from Selected Dimension Stone Inventory Sites Located on School Trust Lands in Lake and Cook Counties. The MNDNR is today releasing third-party geochemical analytical results of eight samples collected by the DNR from four dimension stone inventory sites located on School Trust lands in Lake and Cook Counties. The purpose of the dimension stone inventory is to identify areas of crystalline bedrock in northern Minnesota that exhibit potential for dimension stone quarry development. Dimension stone quarries from northern Minnesota have supplied major architectural, landscape and memorial projects throughout the U.S. Some of notable projects include stonework at the World Trade Center in New York, the National D-Day Memorial in Bedford VA, and the Victory Memorial Drive in Minneapolis, MN. The geochemical analysis is for the following whole-rock major element oxides: SiO2, Al2O3, Fe2O3,MnO, MgO, CaO, Na2O, K2O, TiO2, P2O5, LOI; trace elements: Ba, Sr, Y, Sc, Zr, Be, V, and Total Carbon and Total Sulfur. The data release includes a September, 2015 analytical report from Activation Laboratories, Ltd. (ActLabs) and associated spreadsheet file, and a sample location map. Two new dimension stone prospect sites have been located in Lake County. Dimension stone prospect Site L-210 is a black anorthositic gabbro located in T61-R11-36-SWSE. Site L-231 is a dark gray troctolitic anorthosite located inT61-11-16 NW1/4 NE1/4, NE1/4 NW1/4, SE1/4 NW1/4, SW1/4NE1/4. Both sites exhibit good quarry block potential. Further mineral rights and land issues will need to be addressed prior to a State offering these sites for industrial mineral leases. Report 289: Dimension Stone Inventory of Northern Minnesota 1991. Report 298: Dimension Stone Inventory of Northern Minnesota 1993. Report 298-2: Dimension Stone Inventory of Northern Minnesota 1995. Please note: Best results in viewing these reports will be obtained by saving the files to a location of your choice and opening with Adobe Reader or Acrobat. Some report information may not display as a result of opening with Acrobat directly from a web browser. These reports have been scanned in and applied with optical character recognition (OCR) which electronically translates the scanned image printed text into machine-encoded text. This allows users to then search a document by keywords in Adobe Reader or Acrobat software. Graphic of prospective sites for dimension stone inventoried in parts of Township 60N, Range 11, Lake County, MN. The sites are labeled by their site number. Shown is only a small subset of the 664 sites inventoried. 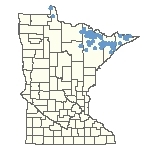 Disclaimer and Copyright Protection: Maps, Reports, Data, and Other Information - The State of Minnesota makes no representations or warranties express or implied, with respect to the use of the information contained herein regardless of its format or the means of its transmission. There is no guarantee or representation to the user as to the accuracy, currency, suitability, completeness, usefulness, or reliability of this information for any purpose. The user accepts the information “as is." The State of Minnesota assumes no responsibility for loss or damage incurred as a result of any user’s reliance on this information. All maps, reports, data, and other information contained herein are protected by copyright. Permission is granted to copy and use the materials herein for any lawful noncommercial purpose. Any user of this information agrees not to transmit or provide access to all or any part of this information to another party unless the user shall include with the information a copy of this disclaimer.